IFR Navigation: General Info Instrument Rating | Instrument Rating Lesson Plans | 7-day IFR Rating | IFR Adventure | Instrument Ground School | Safety Pilot | Holding | IFR Risk | Trip Reports | Flight Profiles | Rating Requirements | After the IFR Rating | Checkride Reviewer | Are you ready? Thanks to “RR” from Tampa Tracon for assistance in preparing this. 1. Repeat your clearance exactly as given, particularly headings and altitudes. "Cleared for takeoff, Runway 5" or "090, two thousand VFR, Cleared ILS 5 approach"
"Atlanta Approach, Skyhawk 12345, Level Six Thousand" or "Climbing tree(3) thousand for niner(9) thousand" or "Leaving fife(5) thousand for two thousand six hundred." If you are leaving an airport and need to check in with departure, be sure to provide altitude leaving. For example, "Miami Approach, Skyhawk 123A, leaving one(1) thousand for tree(3) thousand." When you check in with your destination approach controller, let them know you have the ATIS/AWOS. For example, "Tampa Approach, Skyhawk 123A, Level tree(3) thousand with information echo." If you need to leave the frequency to obtain it, ask before switching. 3. Use proper pronunciation for letters and numbers. November not Nancy. Bravo not Baker. Q like Quebec (Keb-beck) not Cuba. 4. When receiving traffic advisories, your response is one of these two options. Forget the World War II phraseology because you sound stupid saying "Tally ho good chap". 5. If you'd like VFR flight following, they want to know where you are, current altitude & position, aircraft type, and where you want to go. 6. If you'd like to get an IFR clearance in the air, provide your current position & altitude and departure airport on the flight plan. Contact FSS by radio to air-file. 7. If ATC calls you, answer. Don't leave the frequency without letting them know. Whatever you do, don't turn the volume down, they'd like you to be able to hear them when they are calling you with a traffic alert. If you are enroute and you haven't heard them in a while, ask for the altimeter setting to be sure you're still in contact. 8. If you are in trouble, be clear about it. "We might have a problem" is different than "We are low on fuel and wish to declare an emergency." Don't worry about the consequences of declaring an emergency, your safety is far too important. 9. Eliminate extraneous terminology such as beginning every transmission with “And…” and using “With you…” (See #2) Be as brief and clear as possible when communicating your message. Your friendly air traffic controller appreciates it. Thanks to “SD” from Chicago Tracon for assistance in preparing this. 1. Learn how to report altitudes. Some think it sounds cute saying “out of two point six for four point oh” but its nauseating and unprofessional There are only three ways to report altitudes: climbing, descending, and level. Level tree(3) thousand. Two thousand climbing four thousand five hundred. Six thousand descending two thousand. 2. Don’t shorten your call sign until ATC calls you by a shortened call sign. 3. If you call ready to taxi, be ready to taxi. That means your engine is started and you are ready to move within seconds of being given a taxi clearance. 4. When a controller tells you to turn, start your turn. Don’t delay, its your life. 5. Use some radio discipline. You’ve been practicing to think before you speak since you were a child. Don’t press the button until you’ve thought about what you’re going to say. 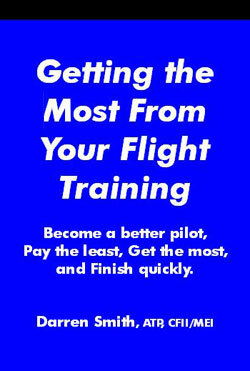 Be a professional, and you’ll get what you need from ATC. Otherwise that busy controller isn’t going to make any effort to assist you. 6. If there is no guidance in the AIM for the transmission you are about to make, be as succinct as possible. Controllers don’t have time to hear your life story. Air time has a value, spend it wisely. 7. Get the ATIS before you call a controller. If you don’t have the ATIS, or you don’t identify the ATIS letter identifier, then, the controller is forced to say, “Verify you have received information alpha.” Don’t say “with numbers…” because the ATIS letter identifier must be confirmed. The controller really doesn’t have time to read the ATIS to you. 9. Don’t switch frequencies until you are supposed to. Switch to tower frequency when you move up to the hold short line and intend to depart. If your departure clearance changes, controllers will expect you to be tuned into ground control and listening even during run up. When arriving, do not switch to ground control until you have been told to and cleared the hold short line. Sometimes you will be told to monitor ground which means don’t speak just do what you’re told. Comments = Thanks for the interesting compilation; great site! Although I've heard it many times in the States, I was a little surprised to see a controller recommend the phrase 'ready for takeoff' in the penultimate point above! My understanding of good practice was that we (pilots & controllers) avoided using the word 'takeoff' before the controller gives the actual takeoff clearance, following the lessons learned from the most deadly aviation accident to date, in Tenerife, 1977?! Perhaps a 'small point', but thought I'd mention it as this list specifically regards best practice!